However, I want to tell you that you are wrong! 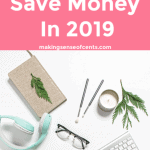 Maybe you don't nerd out as much as I do when it comes to saving money, but there are plenty of ways to learn how to make saving money fun. Learning to have fun saving money is always a good idea, because it can help you save more money. This is why I believe the best way to save money is to learn how to make saving money fun. This can help keep you motivated and interested in saving money. 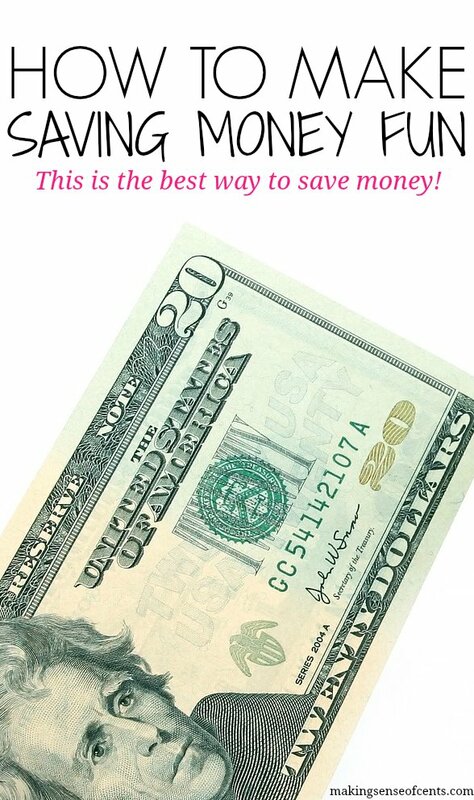 Below are some great tips on how to make saving money fun. Enjoy! Challenging yourself to save more money is great, because it can help keep your financial goal on your mind and keep you motivated. Take part in the $20 Savings Challenge and save over $1,000 easily. Challenge yourself to beat spending areas you constantly struggle with. You could try to spend less money on gas, food, utilities, and more. Whenever you do spend money on a “want,” you can put that same amount of money into your savings account. So, if you buy a $35 clothing item, then you need to also put $35 towards savings or debt. This will make things seem much more expensive, so you are likely to spend less! Take part in a no spend challenge. Read more about this in the section below. Take part in a no spend challenge. To some people, a no spend challenge may not be the most fun thing in the world. However, they can be a great way to let your creative side come out, because you will have to make do with what you already have. You can do a challenge where you don't buy any clothing, pantry food items, coffee, gas, and so on. No spend challenges can prevent impulse spending. You will find use in the items you already have. A no spend challenge can motivate a person. It can help you declutter and prevent waste. Read further at The Power Of A No Spend Challenge. You can even go a step further by making it a challenge between you and someone else. You can turn it into a fun challenge between your friends, family members, or coworkers. Think of this as similar to when a person has a weight loss buddy. By having someone rooting you on, who is also going through both the good and bad times, you may be more likely to reach your financial goals. You can compete with others to see who can save the most money, who can go the longest without buying a certain item, who can pay off debt first, and more. I'm not just saying this because Making Sense of Cents is a personal finance blog. I truly believe that reading personal finance blogs can help keep you interested in saving money. 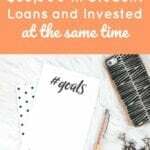 Personal finance blogs are great for seeing how other real people are doing with their financial goals, to introduce you to things you haven't thought of, and for possibly joining a community of others who have similar goals as yours. Making your goal visual is a great way to find motivation and make saving money fun. Create a graphic that demonstrates your financial goal. An example of this would work for something like paying off your house. You could have a picture of a house and section it into 100 pieces. Then, each time you reach a small payoff goal, you can color a piece in. I did some research and found a blog post on A Cultivated Nest about many other creative ways to do this. Keep a picture of your goal on hand. Whether your goal is a vacation, your dream home, an item you want, or something else, having a picture will keep you reminded of it. You could even go all out and create a vision board on Pinterest or on a poster board. Start a blog. 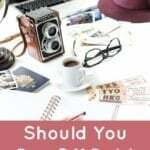 Blogging greatly helped me with my financial goals, because I could easily look back to see how I was doing, and the blogging community was very supportive. Plus, I felt like I had to keep myself accountable and kept improving because everything was public. If interested, you can start a blog for cheap with my easy tutorial. There are plenty of ways to enjoy your life while staying on a realistic budget. In fact, I believe that many of the great ways to have fun are free or affordable. We spend hardly any money within our entertainment budget each month and still have a great time filled with new experiences. Just check out my Instagram if you don’t believe me! Mystery shopping, while it won’t make you rich, it can be an easy way to earn free meals at restaurants, free outings, free hotel stays, and more. Take advantage of happy hours. Sign up for email lists. You can earn valuable coupons, free visits, and more by doing this. Churn credit cards so you can travel for cheap, earn free cash, gift cards, and more. Read How I’ve Earned Over $2,500 in Credit Card Rewards in 2015 for more information. Go outside for a bike ride, hike, walk, run, swim, and more. Volunteer at events. Many events and festivals need volunteers. This may allow you free admission when you are done with your job! Find free attractions in your city. In some cities, there might be free visits to the zoo, museums, concerts, and more. Are you interested in learning how to make saving money fun? What do you think is the best way to save money? If you are looking for a cheap cell phone service, check out Republic Wireless. Republic Wireless is a service I’ve been using for over one year now, and I’m still happy with the service. They have monthly cell phone plans as low as $5 per month. Read Saving Over $2,000 A Year With Republic Wireless Review. If you have trouble eating at home, then try out $5 Meal Plan. They send meal plans directly to your email. It’s a service that I personally use and me and my husband love it! Refinance your student loans. I recommend Credible for student loan refinancing. You can lower the interest rate on your student loans significantly by using Credible which may help you shave thousands off your student loan bill over time. I also recommend looking into Digit if you want to learn how to make saving money fun. Digit is a FREE service that looks at your spending and transfers money to a savings account for you. Digit makes everything easy so that you can start saving money with very little effort, plus when you reach certain savings amounts, you receive funny texts from them, which can make your day. Earn side money from home easily, by taking surveys. This can earn you cash, gift cards, free items, and more so that you can spend less money! Survey companies I recommend include VIP Voice, American Consumer Opinion, Survey Junkie, Clear Voice Surveys, Product Report Card, Survey Club, YouGov, ProOpinion, Pinecone Research, Opinion Outpost, Survey Spot, SaySo4Profit, PanelBucks, PaidSurveys, and Harris Poll Online. They’re free to join and free to use! You get paid to answer surveys and to test products. It’s best to sign up for as many as you can as that way you can receive the most surveys and make the most money. As you all know, I believe that earning more money is the best way to save money. I think I’m kinda addicted to saving money. One of my favorite things to do is check out my savings and retirement accounts at least once a week to see how everything is doing. It’s such a good feeling to add to those accounts! 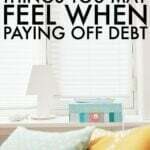 I love not spending on “wants” and using that money instead to save, or pay off debt. And I love reading about personal finance. Does that make me a nerd? It probably does. I’m a big fan of using visual motivators to keep me working towards savings, paying off debt, or any other goals I might have. It is amazing the extra push it can give you to keep going. Last year we set a huge savings goal so that my husband could quit his job and go back to school full time. I made a chart for how much we needed to save and then colored it in each month. It was super exciting because we saved up the money we needed much faster than I thought we could! Watching the chart get colored in was really motivating! Tracking progress is so important. For a while, I switched to various digital trackers. But I’ve found there’s really something satisfying about taking pen (or marker!) to paper. I also love competing with my husband. We each have different side hustles, so we like to see who can bring home more each month. We make sure to celebrate no matter what, though, so it doesn’t breed any negativity. We figure any extra income is a big help! Yes, I really love tracking everything myself on pen, paper, and Excel. I think making it fun and participating in no spend challenges is the way to go. It enables you to be a part of a community and it’s exciting. We are doing a no spend month this month since we spent so much on our home remodeling project January – February. It hasn’t been hard, and it has been kinda fun! It’s nice to get creative instead of hitting the store. We really don’t need much! We enjoy the creativity it requires to save money. Figuring out how to use what we have, fix things, or find free pastimes has led to lots of entertainment! I have never participated in a no spend challenge. I am considering trying that in one of the upcoming months. I agree that visualization makes savings goals a lot more attainable. I have a vision board on my wall and one my goals is financial. I put an image of $100 bills on it. I can totally empathize with the “numbers nerd” part of this post – one of my favorite things to do is to play with spreadsheets and calculate how we could lower our costs and save for a big item in x amount of time. I do keep a blog for accountability, and also like to find creative ways to meet needs without having to spend as much money as I thought we might have to spend. For example, this past weekend we re-arranged a lot of our furniture/rooms to make our house flow better without spending a single thing on decorating (though now I know what we need to finish things off, and thankfully it is much less!). I think that these are great ideas! I love the idea of making a goal into a puzzle with puzzle pieces. That is a great visual for visual people. It is so hard to be focused with a dreaded task like saving money. Yep, saving money can be fun when you beat your goals. Even if that’s just a daily goal. Each day that we come in under the daily limit makes me a little gleeful. Then again, it pays to be easily amused. This post is jam-packed with great ideas. My mom actually had a discussion with me about saving money the other day (I generally view her as a financial lost cause). I told her she should try a no-spend challenge, starting with just one week. We will see how that goes . . . I love the idea of putting the same amount of money you spend on a “want” into your savings account or towards debt. Such a good way to bring awareness to how much you’re spending on the unnecessary things too! This is great content. And really helpful. It is true that saving money can be fun, if the target is set on mind as how much to be saved & how long. Under the current scenario, where market situation is fluctuating, saved money at times can be a ray of hope, during tough times. Saving habit shouldn’t be limited to self only, rather it needs to be spread among peer mates & loved ones. Yes, I completely agree! I hardly ever spend money on myself anymore and I just have no interest in shopping. Maybe I’m too lazy for it now haha. I think saving money is the most fun when you’re able to see how much money you have saved and are able to watch your savings grow. I like to automate my savings as much as possible such as 401k contributions. When I get my tax returns, I instantly invest them in things like index funs, so the money isn’t just sitting in my checking account where I could easly spend it. I also began saving money by not eating out as much and finding ways to have fun at home instead of going out as much. I think tracking my net worth with Mint made saving more fun for me. It was exciting seeing my negative net worth turn to positive and i’ll be ecstatic when it hopefully hits six figures in the distant future. I also like seeing how much I can sock away and still live comfortably. I try to create my own personal no spend challenge many months of the year. I works well for me to avoid spending lots of $$$. I’ve been able to spend nothing at all for the month except for just gas money to get to work (outside of normal stuff like food and a mortgage). It really does work if you can commit to it! Oh wow, thanks for these survey company recommendations! I will definitely check these out. Welcome. There are so many! Great article! I love your advice to create visual financial goals and getting competitive. Both of those tactics along with reading up on financial advice and sticking (as hard as it can be at times) to a solid budget that is realistic. I have struggled with wanting to dive in head first and cut all unnecessary expenses but I leave myself with no wiggle room. That only sets me up for failure, we all need a little indulgence now and then. 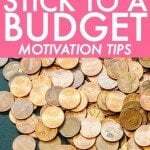 Be it a smoothie, a candy bar, or a new purse we all need to have some reward system set up to help motivate us to stick with a budget and enjoy saving our money for future use. I feel like I get a “runner’s type high” whenever I am under on my grocery budget lol. Whenever I’ve decluttered a room or come out way under budget on something I feel like I just climbed mount everest lol. These are really fantastic ways you have mentioned. I have been lucky to read this article as most of the time I have to take step with any preparation to spend money. Sometimes I get stuck where should I spend saved bucks.